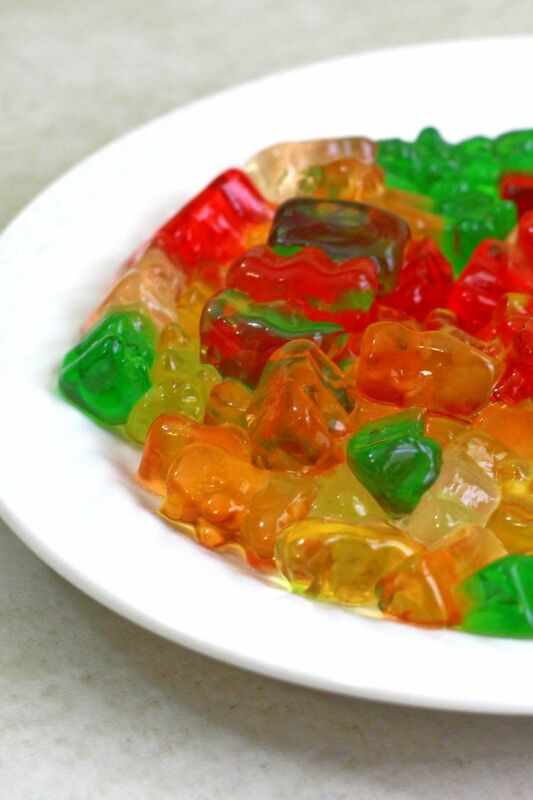 When you soak gummy bears in vodka, they absorb the alcohol and turn into yummy fruity Vodka Gummy Bears. Since we first published this guide, we’ve found a much quicker, simpler way to make this delicious treat. So you’ve tried all the cocktails in 15 Candy Drinks that Taste Like Childhood Treats and now you want to make something even more spectacular. Something where the alcohol and the candy are all in one. The old method for making Vodka Gummy Bears took days. You had to pour vodka into a bowl of bears, cover the bowl and put it in the refrigerator for days – up to a week. 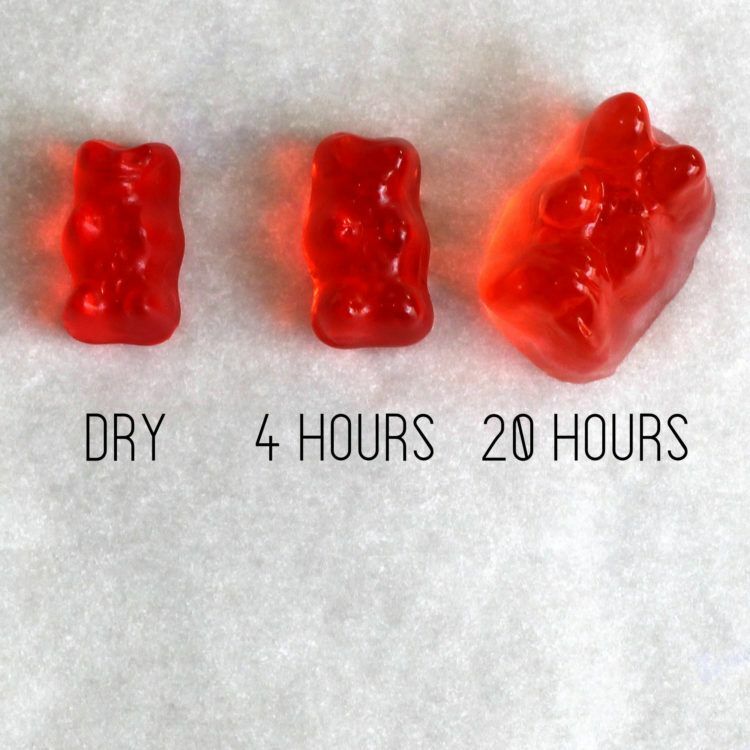 This new method takes less than a day, and the gummy bears get much bigger. It’s so easy, and the bears come out a little more firm and less slimy, too. 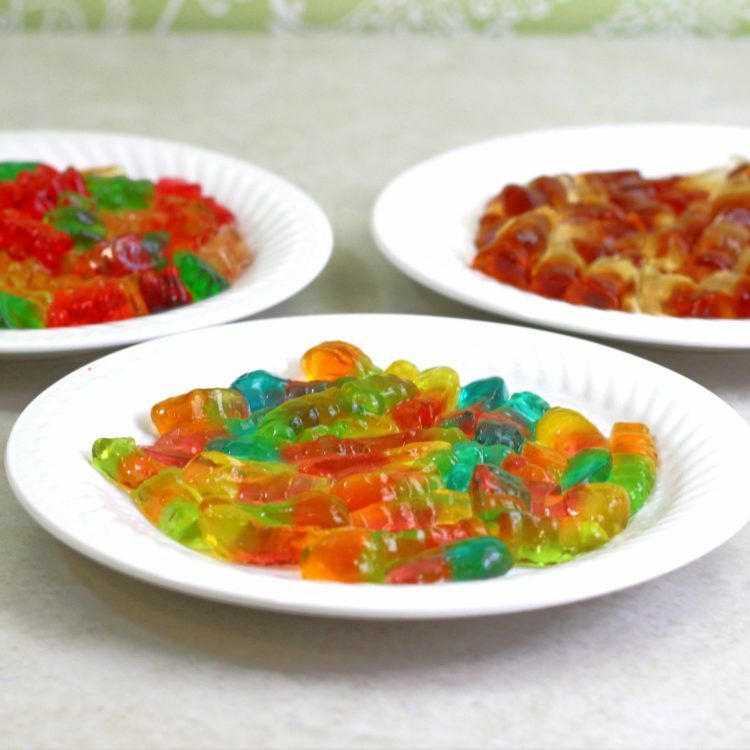 This time, we decided to test the method on gummy bears, gummy worms and gummy cola bottles. Because, why not? The more the merrier, right? Time to complete: 20-24 hours. Your prep time is just 10-15 minutes to put the gummies in bowls. The rest of that time is just letting them soak while you go do something fun. I recommend the Haribo brand (linked above) because I’ve never had them turn gooey or stay small. They’ve worked well with Svedka, Smirnoff and Absolut. You don’t need an expensive vodka – something mid-range is fine because you’ll barely taste it anyway. There’s no reason to waste top shelf vodka on this project. Note: a couple of commenters have reported trouble with “cheap” brands of vodka. I can tell you for sure that Svedka and Smirnoff work, and you can usually get the big 1.75l bottles for around $20. These are the same brands I’ve used for making Skittles Vodka and Jolly Rancher Vodka, and they have always worked well for me. I kept out a dry gummy of each type so I could compare their size to the ones that were soaking. Note: the bowl in the lower right corner has rummy cola gummies, which ended up being so good that I gave them their own post. 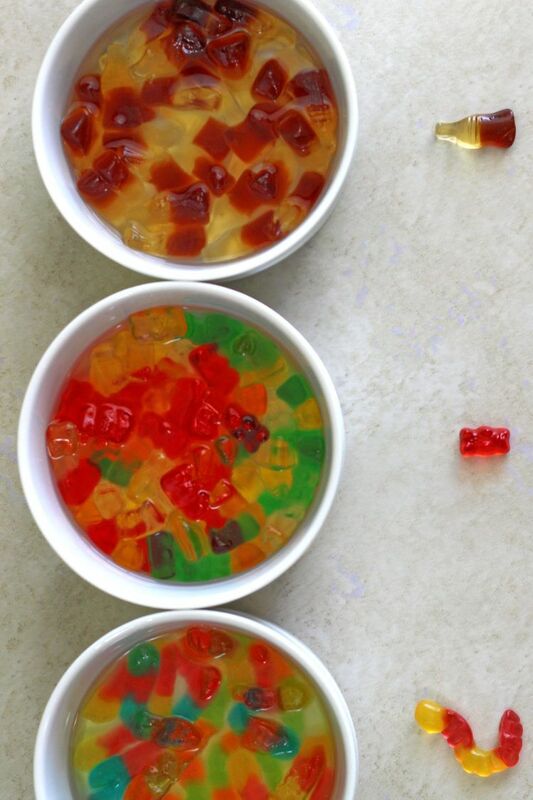 Next, pour enough vodka into each bowl to cover the gummies well. At this point, you’re done until the vodka has all been soaked up. You can cover the bowls to keep the fruity smell from filling up the room, but you do not need to cover or refrigerate them. I know, I know – in the earlier version of this tutorial, I said you did. I told you to cover them well and leave them in the fridge for at least five days. But it actually works much faster if you just let them sit out in a bowl. After about four hours, I fished out a gummy of each type, and put them beside the dry one. They were noticeably bigger, especially the worm, but I thought they could get bigger still. I ended up letting them soak overnight. The next morning when I got up, about 20 hours had passed since the beginning of the experiment, and I fished out another gummy for comparison. You can see the difference for yourself. 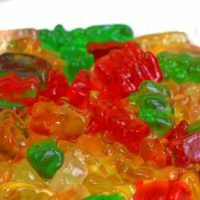 First, the gummy bears – dry, at 4 hours in vodka, and at 20 hours in vodka. And now the worms – again, dry, 4 hours and 20 hours. See how much bigger they get after 20 hours? Once these are done, they get slippery and a little bit slimy. To serve, I recommend you spoon them out onto a flat dish or surface. As you do so, you’ll find some of them have gotten stuck together. Just wedge your spoon gently in between them and they’ll pop apart. Offer guests spoons or appetizer forks to stab them. Toothpicks can also work. And here they all are together, served on a table. 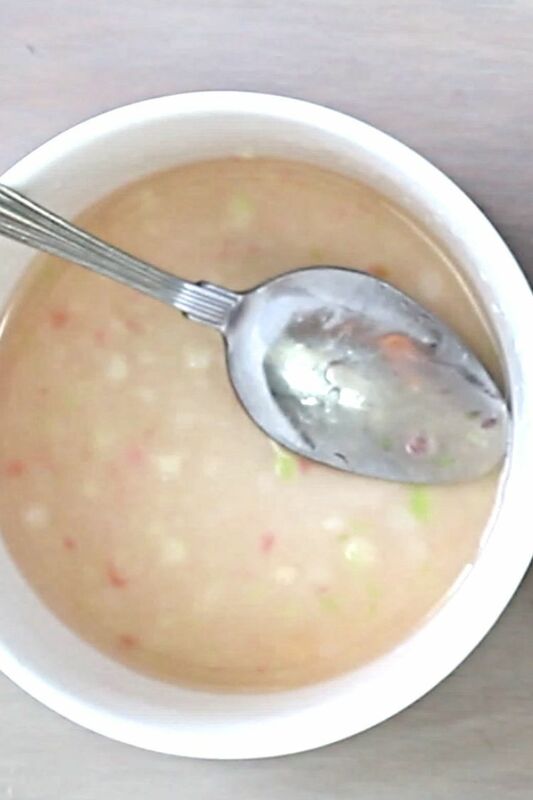 There will be a little bit of “juice” left over at the bottom of the bowl you soaked them in. This can easily be soaked up with a marshmallow or a piece of cake. 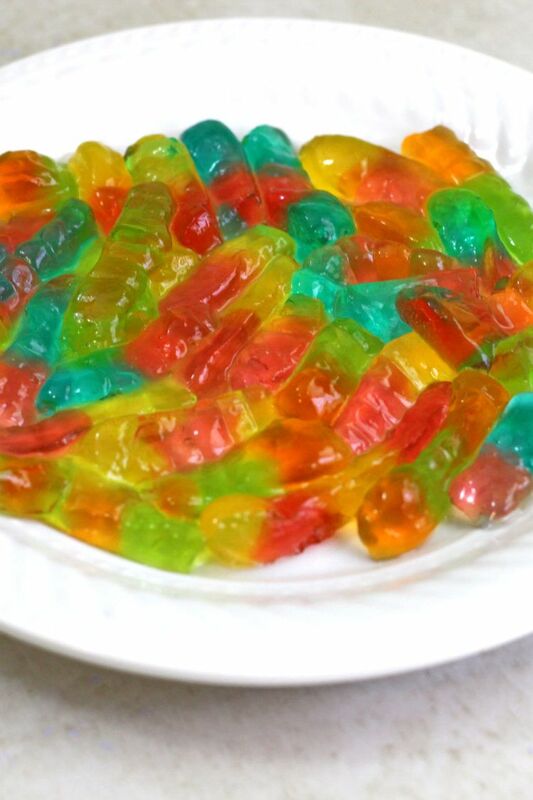 I keep getting some questions about these gummy vodka concoctions, so here goes. These taste just like the candies, except with a little of that vodka burn. The vodka really doesn’t do anything to alter the flavor. There’s been a lot of speculation about how much (or little) vodka is in Vodka Gummy Bears, so I weighed them dry and post-soaking. This won’t be exact, but it should be somewhat useful. Dry, the bears weigh 2 grams and the worms weigh 5 grams. Soaked, the bears gained 2 grams of alcohol and the worms took on 3 grams. 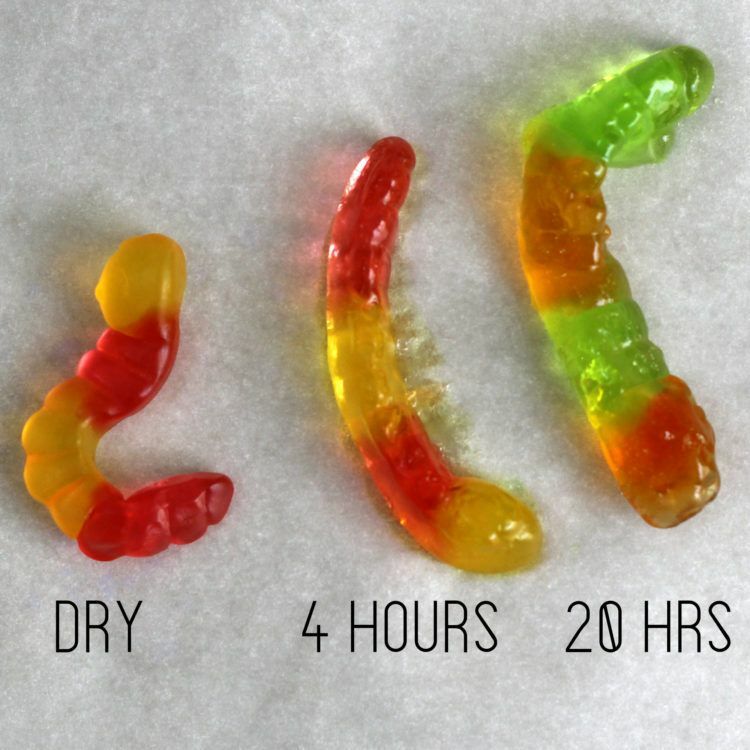 Other gummies you use may vary. In ounces, this means that each bear contains about 0.071 ounces of vodka and each worm contains 0.106 ounces. So to equal a standard drink (1 1/2 ounces), you need about 21 bears or about 14 worms. Again, that’s not exact. And different brands will probably vary. But I think it’s safe to say these don’t hold some shocking amount of alcohol per gummy. Still… did you ever eat 21 gummy bears at a sitting? Sure you did. It’s not that hard to do. So keep that in mind as you enjoy. Some readers have reported their bears turning to mush. We’re not sure why this happens. I originally thought it might have to do with the brands of bears and vodka used, but some people have had trouble despite using the exact brands I used here. This is a great way to turn a bar fail into something delicious that seems like it was on purpose. Will the alcohol evaporate if you use this method, leaving the bears weak on alcohol? Short answer: no, not really. Longer answer: the amount of evaporation that takes place over less than 24 hours is negligible. And by that time, the alcohol has soaked into the bears where it’s trapped until you eat them. 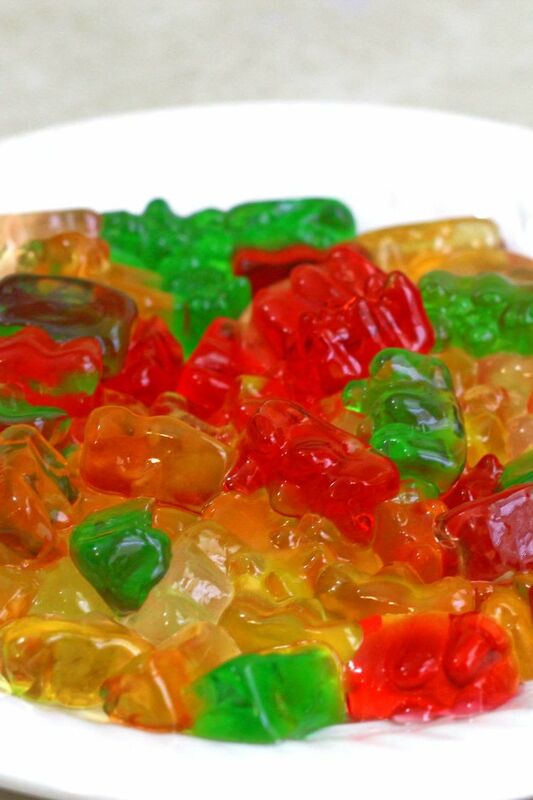 Gummy bears absorb vodka, swell up, and turn into delicious, soft, juicy alcohol treats! For adults only. 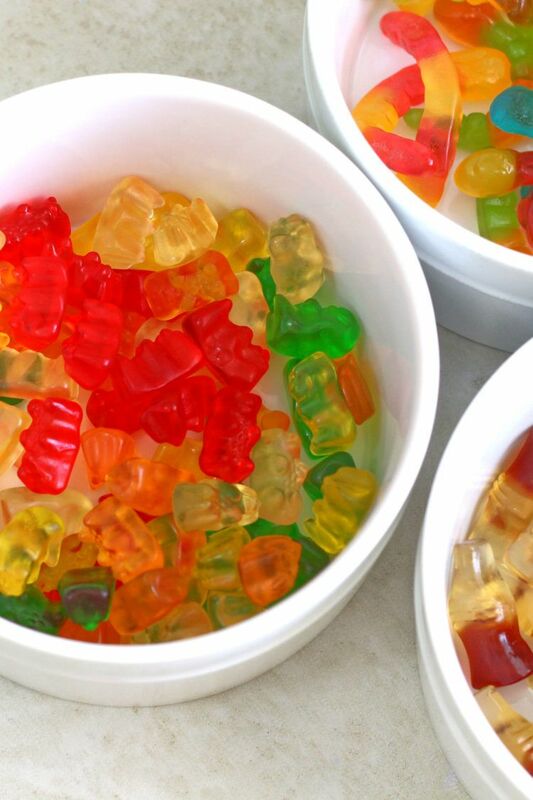 Put the gummy bears into a bowl. I used Svedka vodka and Haribo gummy bears. Some people have gotten worse results with different brands, although most of them probably work just fine. In the photos here, I used several 5 ounce bags. Hi there, thank you for such a great recipe. I’m going to make them for a bachelorette party and want to give each bachelorette a pot. What size pot did you use? I used a 10 ounce bowl, and I think at least 6 ounces of vodka. I think that might be a bit much for one person. You might want to try a 6 ounce bowl with about three ounces of vodka, which is equivalent to two standard drinks. Are the gummy bears supposed to hard I put them in the refrigerator covered and they are hard. I just Bacardi alcohol and Haribo gummy bears bears and they are slimy. Any suggestions? That’s the old method. Re-read the article. Don’t put them in the fridge and don’t cover them. They come out softer and less slimy. I used Albanese gummies because they are so flavorful and juicy. They turned out great! I used peach and pineapple and they were a huge hit. I experimented with black cherry but they tasted like cough medicine. Oh good! I wanted to use this brand because they are SO MUCH YUMMIER than other brands! 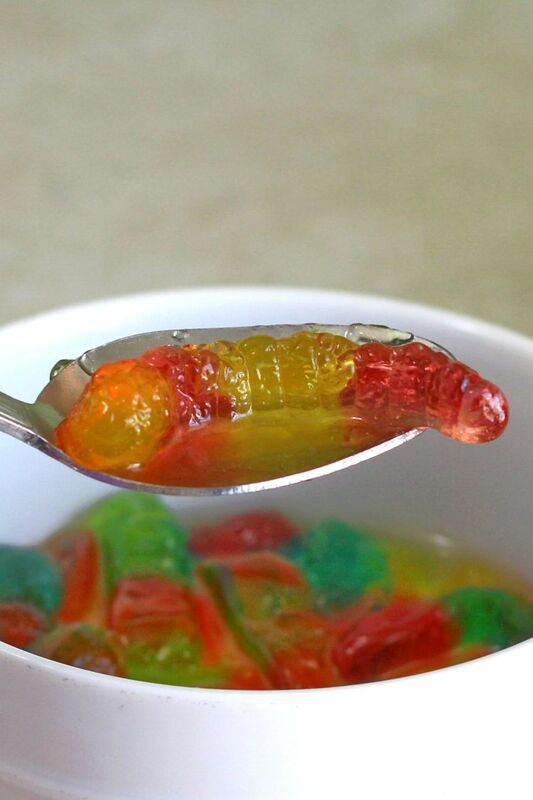 I tried it with cheap cheap vodka and probably 15 worms as a trial in the fridge a couple of weeks ago and they turned out good, but I’m having a Halloween party tomorrow night and totally forgot to buy the vodka and gummies and start soaking them a few days ago so I was looking for a quicker option. I hope mine turn out as good as yours! This research deserves a Nobel prize. I’d like to know if you’ve ever tried these with sugar-free gummies?? Yes! It works, but they don’t swell up as big. Still pretty cool, though.